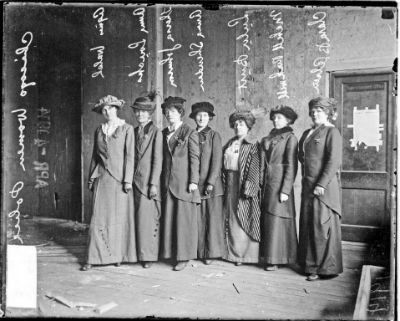 Policewomen Agnes Walsh (from left), Anna Loucks, Theresa Johnson, Anna Sheridan, Lulu Burt, Mabel Rockwell, and Miss Clara B. Olsen. On August 5, 1913, ten women were sworn in as officers – or “copettes” as one reporter called them – for the Chicago Police Department. The women, all trained as social workers, did not wear uniforms or carry revolvers but they did have a badge. Few police departments and politicians supported the effort. Many labeled the crusade unnecessary and a waste of money. Others argued that women were physically incapable of being officers. Even after many cities passed ordinances authorizing the hiring of women officers in the late 19th and early 20th centuries, few appropriations were made to actually make the hires. Chicago Mayor Carter Harrison pushed the city council to hire female officers for the department in 1913. An order was passed, and Harrison appointed ten women. Police training consisted of a two hour lecture delivered by the terrifically named Chief McWeeny (especially fitting considering the pervasive belief that women were not strong enough to be officers) who told the new recruits to have compassion, not be “too strenuous,” “don’t be too nosy,” and to “present all cases fairly and squarely.” The women then received a police whistle, a book of rules, and badge. Two days later, on August 7th, two of the female officers made their first arrest. It was of another woman, Nellie Cameron, for disorderly conduct. The novelty of women arresting women attracted a fair bit of media attention. Everyone was eager to see how women would handle a potentially physical interaction in making arrests. One officer claimed that female criminals would put up a bigger fight than normal for policewomen because they would not be afraid of another woman. Those opposed to policewomen jumped on every opportunity to show that women could not handle the work, though given the limited role and power (not to mention gear and a proper uniform) afforded these early women officers, the comparison of male and female officers could hardly be fair. Women’s path into police work and law enforcement was long and hard. In 1913, there were 38 in the U.S. By 1915, this number had risen to 70 in 26 cities. Most served in limited roles, mostly keeping order among women and children, in public places. It would be decades more before they earned a more equal place on the force. Even so, these early women forged a pioneering course. There are few things in history that I love more than what I like to refer to as “women in unexpected places.” It’s usually a job or activity deemed “unwomanly” or dangerous to feminine virtue for one lame (and generally unconvincing, at least to me) reason or another. This is what draws me to policewomen and people like 19th century phrenologist, educator, and doctor Lydia Folger, who had her own medical practice (at a time when women struggled to even be educated and get adequate medical care) and wrote books and gave lectures on such taboo topics as the workings of the female body. Folger and other women like her were leaning in long before Sheryl Sandberg, and their stories have long energized and encouraged me. Really, they are the reason I do history.